Talk about a delicious deal! You can transform a life by eating pizza! We’re teaming with the Silverdale MOD Pizza ALL DAY Mon., May 13, for a fundraiser that supports student success at Olympic College. Simply download and print this flyer or save an image on your phone. We get 20 percent of food and beverage sales that day for customers who either show the flyer OR tell the cashier they are there to support Olympic College. Offer is valid for dine-in or take-out only. Online and phone orders are excluded. Now that’s a win-win! You get made-to-order pizza and a break from cooking, OC students get scholarships, textbooks, emergency assistance and more. Check out our latest issues. Please visit our Give Now page to make your donation today! If you are RSVPing for multiple people, please submit their names and email or mailing address below. 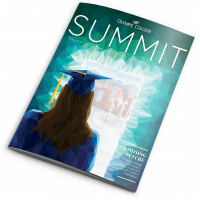 Never miss an issue of SUMMIT magazine and stay up to date with THE LOOKOUT E-News. Share your story! What are you up to these days? Please list list any honors, awards, and/or accomplishments that you would like us to know about. Why did you choose Olympic College? What is your favorite memory of OC?